SPORTING PERSONALITIES: It is a truth of life to those who believe, that "God blesses those who give of their lives and resources" - giving of your time, giving of your talents and giving of your love, be it in the 'recreation' of Sports or in the creation of life! To those who know, 'Thanking God' is a great act of simple gratitude - but with it comes greater gain! Abu Fuard worked hard in whatever he applied himself - to reap a harvest of rewards! Like the farmer who 'puts his hand to the plough' in the field and plods on, to pluck the fruits of success and distributing the delights with others. Abu did likewise in his 'long innings' of over 30 years in his illuminating Cricketing career, on and off the cricket fields! As one of Sri Lanka's sensational 'super-duper' off-spin bowlers, highly acclaimed in the past as one of the best in Asia's Cricketing arena, Abu has come to 'grips' with life (as he did so well with the cricket-ball), accepting the good that came his way to do good for others! "To err is human - to forgive is divine" makes one realize that people are apt to make mistakes but learning from one's mistakes is more profitable to life. Abu had in his 'run of play'- 'spun-out' powerful people (at 'Silly-point"!) who may have been 'narrow-minded' in their motives and more focused on their 'own gains, than for the good of the game and the players themselves! By propelling his 'variations' he had misunderstandings and 'mix-ups'...but the 'breakthroughs' - (some 'bowled-out' and some 'caught-out', with no questionable 'LBW's!) - came before "stumps (or daggers!) were drawn" !! Resulting from the 'breakthroughs', many a talented Cricketer was in due course identified and given the opportunity or a 'chance' to play for Sri Lanka, picked from across the 'barriers' of the North, South, East, West and Central parts of the island. Perhaps it was an easy task for the Selectors to 'pick the best' from the metropolis, Colombo - players knew well that if they played for a Colombo club, they would stand a good chance for selection in the Sri Lanka side!' It is no secret in Sri Lanka Cricket, that Abu Fuard, (backed by a former Ananda Captain Dhanasiri Weerasinghe), from the mid-Seventies, was 'instrumental' in paving the way for more, young exciting cricketers from the outstations, to add 'glamour' to Sri Lanka cricket - and a few years later a 'new tune' was played..."we are the Champions!" During the illustrious tenure of Robert Senanayake, from 1957 to 1976 as President of the BCCSL, the 'pace' changed and 'new things' began to happen in 1973! With a new Sports Law in 1976 which declared that office-bearers could hold their posts for only two years in succession, Robert Senanayake's devoted service of 20 years came to an end! Some of the dedicated administrators Sri Lanka Cricket had from the early 50's to mid 90's, were J.R. Jayawardene (1952 to '56), Robert Senanayake (1957 to '76), Maj. Gen. B.R. Heyn (1976 to '78), Dr. N.M. Dr. Perera (1978 to '80), Gamini Dissanayake (1981 to '89), P.I. Peiris and Lakshman Jayakody (1989 to '91), Tyronne Fernando (1991 to '94). In his term as President of the SL Cricket Board (BCCSL), Gamini Dissanayke took over at a crucial stage in the history of Sri Lanka Cricket, to continue his efforts from 1981 to obtain full ICC status for Sri Lanka. Abu had been a close friend of Gamini Dissanyake, (who stayed down the same lane in the opposite house from 1974). "We often met and had discussions on the betterment of cricket" - said Abu "and I executed the plans and programs entrusted to me, preparing the infrastructure, planning, finances, etc; to perfection - and assisted him in the 'ground' work for obtaining Test Status." An ICC condition given to Gamini in 1981 at the ICC members meeting, was to ensure that additional Test Playing Venues would be constructed to international standards in Kandy and in Galle, within a year. Gamini entrusted the responsibility to Abu, to transform the Trinity College Kandy grounds at Asgiriya into an international Test playing venue. Cutting a long story short, Abu ensured that this requirement was fulfilled and Gamini went back to the ICC in London, to 'bag' his greatest achievement in cricket. England played the Sri Lanka Test Team in their first Official Test Match in Colombo, from 17th to 22nd February 1982. Abu has been blessed with a lovely wife Fawziya whose love, care and concern are exemplary and Abu is pleasantly satisfied as he approaches his birthday in December this year...to reach the proverbial - "Three score and ten" 70 years in age! Abu was bonr in 1936, inheriting his father's brilliance and cricketing talent from the age of 13, A Lawyer by profession A.M. Fuard, (Abu's father) Captained Wesley College, Colombo in 1915 and went on to play for the Moors Sports Club in 1916, to perform the 'double' in scoring 1000 runs and taking 100 wickets in all the matches that season. 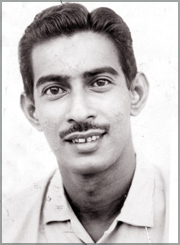 Abu Fuard commenced playing for Wesley College in 1951, at an early age of 14 yrs and continued a 'star-spangled' school cricketing career up to 1954. He first played under Radley Claessen in 1951, Brian Claessen in 1952 and his brother Ansar Fuard in 1953. Abu bears bitter memories of the manner in which he was deprived of captaincy in 1954 as he had three more years to play for the school. Although he was certain of captaining in 1955, to his horror he discovered through the "Evening Observer" (in an article published by one of Sri Lanka's best Sports Reporters in the fifties, Eustace Rulach), that some other boy had been appointed the captain. This caused a phenomenal change in his young life and with a change in his attitude, he expressed it in 'no small way' to the school authorities in charge of Cricket. Abu said "I was too young to handle this disappointment - I just changed from being a 'little lamb' to an angry lion!" In fact, Abu took an immediate decision to quit school in protest, which gave the Principal and Master-in-Charge a rude shock, when they were told that he will not play for the team again. This compulsive action caused a reaction in his character, making him more alert to the adversities of life and created in him a tougher 'line-of-action'. With no time wasted, Abu launched out into a career of Insurance at the age of nineteen, which he has pursued over the last 51 years and continues to this day, as an Insurance Agent and Consultant. In cricket too, Abu had represented the Moors Sports Club while still at School, from 1951 to early 1953. He then dedicated himself to playing serious club Cricket, and joined the Colts Cricket Club up to 1967. From 1968 to 1971 he benefitted by playing for the Colombo Cricket Club, although Abu had 'hung-up' his boots in 1967! In earlier times, he put in long hours of practice and played Cricket 'real hard' to gain his position in the Sri Lanka team from 1956 to 1971 a period of fifteen long years. Although Abu began his cricketing career as a pace-bowler in his youth, he was 'picked' by his coach at Wesley College, A.V. Fernando, to take up to Spin bowling which he did like a 'duck takes to water' ! Some of his outstanding performances in the following years included a haul of 6 for 76 against S. Thomas' College Mt. Lavinia, 8 wickets for 60 against Royal and 9 for 53 against Prince of Wales. As a great all-rounder, he excelled in batting and he was associated with Brian Claessen in a record-breaking partnership of 231 runs against Richmond College, Galle. From this point onwards, there was no turning back and his progress and prowess in cricket as a 'Great Gentleman Cricketer' grew steadily over the years extending to Cricket Administration and Management completing 31 years dedicated service and leadership, to Sir Lanka Cricket Board, a Selector from '75 to '86 (Chairman from '82 to '86), the first Team Manager of Sri Lanka in 1975 on their tour to Bangladesh and in '79 he was Asst. Manager to Maj.Gen. B.R. Heyn on the UK tour. From 1985, he was appointed Manager of the Sri Lanka Team for three years. In 1996, Abu received a "Testimonial" for his great contribution to Sri Lanka Cricket, both as a Test Player and for Administration and Management, at a 'Benefit Match' played in Sharjah, where Michael Holding of the West Indies and Abdul H. Kardar of Pakistan, also received "Benefits". His greatest recollections of outstanding Sri Lanka cricketers in his time, starts with C.I. Gunesekera, who he considers the finest Captain, who maintained high standards of discipline and led by example. Abu recalled with laughter how 'C.I' always called Abu 'Master' even on the field he would say "Master, will you bowl?" and Abu would promptly shoot back "Yes Sir" and this would go on in their record breaking batting partnerships too! "Master, come one!" and Abu would say "Yes Sir" and run...but he yet does not know why C.I. called him "Master"! Norman de La Harpe, Tita Nathanielsz, Pat Kelly, Makkin Salih, Laddie Outschorn, Vernon Prins, H.I.K. Fernando, Stanley Jayasinghe, P.I Peiris and Gamini Goonasena are some of the others he can vouch for as true 'Gentlemen Cricketers'! In bowling, Anuruddha Polonowita and Abu were likened to the famous West Indian 'spin-twins' Ramadhin and Valentine, but there were others too, like Neil Chanmugam, Fritz Crozier, Annesley de Silva, Daya Sahabandu and last but by no means least is C.I. Gunesekera. Abu's highlights of the numerous occasions on which he has performed brilliantly in School, Club and Sri Lanka Test Cricket is in 1964 when he claimed 6 wickets for 31 runs against Joe Lister's International XI. To his mind, he thinks his greatest thrill and achievement has been his success in 1973, to have made a way and opened the doors for the 'outstation Cricketers' to be given their chance for selection to play for Sri Lanka.